Heavy Duty Billet Sonnax Upgrade. 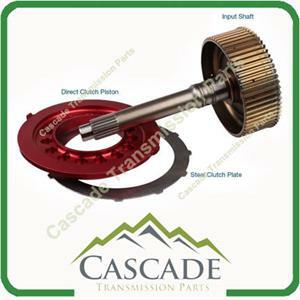 The OE Input Shaft has many issues due to its Two piece design. The OE design has splines that mate the shaft to the clutch hub. These splines are Very weak and under High Horsepower / Towing Applications they have a tendency to fail. Sonnax addressed this issue by engineering a Billet version of the hub and shaft out of 300M Forged Steel. Engineering this from Billet Forged Steel eliminated that weak OE Joint. Sonnax also Extended the Clutch Hub to hold one Extra Friction Plate / Clutch. Steel Plate /Friction Plate / Clutch. Adding this Clutch gives the drum more holding strength , and greater heat dissipation capabilities. These Upgrades make this Sonnax Package Last Even Under High Horsepower and Towing Applications! Photo provided by Sonnax illustrates everything included in this Kit.